The Web is an arena where all businesses are competing for attention. It is a place where you are either winning or losing, and if you are not playing, you are definitely losing. With the millennials now representing a significant portion of the workforce and everyone becoming tech savvy, gone are the days of setting up a website and sha'bam, in comes the clients. If all you do is build it, they will not come. Worry not though, we've compiled a list of the top 5 things you should be doing online to grow your business and beat the competition. Being set-up with Google Analytics (GA), Google Webmaster Tools (GWMT), and Bing Webmaster Tools (BWMT) is hugely important. If setting up a website is the first thing you do for your business, this should be the immediate second. Google & Bing have created a platform for you to communicate with them about your website through their webmaster tools. The benefit is it will help keep you aware of any issues Bing or Google detect about your website (404 errors, inaccessible content, etc.) and using their tools will help you rank and be found on their search engines. As we all know, being at the top of Google can be worth big bucks so it is important to get started right away. All you need to get started is a Gmail account to access GWMT, and GA, and a outlook email address to access Bing. Think about this: every client you have knows at least 5 people that would also be excellent potential clients. So, why are you not email marketing to them? You could potentially quintuple your business just by leveraging your existing client base! Now, DO NOT use your regular old Gmail account to blast a list of 100+ people. That is a huge no-no in email marketing best practices. Moreover, it could get you kicked from your email service provider (ESP) if they even allow the email to go out in the first place. What you should be using is an email marketing platform (EMP). We recommend Mailchimp. They offer a free account with lists under 2K total email addresses, it is easy to use, and integrates well with WordPress sites. Also, if you upgrade to a paid account you can do nifty things like set up drip campaigns or auto-responders that will email a happy birthday to your clients on their birthday, thank them for their business after you complete their project, or offer promotions on holidays. If you have a brick-and-mortar covering a service area, or if you have clients visit your location, being on Google Places for Business is essential. 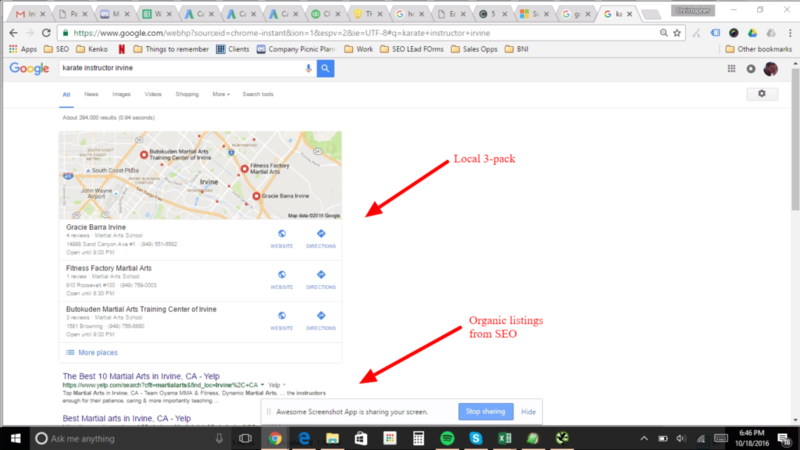 It is how you get on Google's Map and get on their local 3-pack for local searches. It is pretty simple to set up and will have a huge impact on your business. Just search "google places for business" or you can click on this link. From there, you can search for your business. If you find it, you can claim the listing and begin editing and enriching your profile. If you do not find your business then you can set up a brand new profile. Once your profile is set up, Google will mail a postcard with a 4-6 digit PIN. They do this to ensure that you actually have a business location and are able to receive mail there. 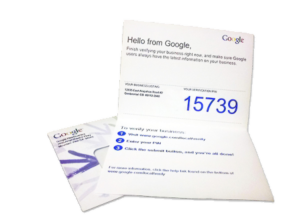 After you have received your post card, go back to your Google Business page and enter the PIN to verify your account. Once that is completed, you are off to the races and will be more easily found for local searches! Be sure to build out your profile, add copy, images, and work with your clients to get reviews on your page to make the most of your Google Business listing! Google wants your site to be more like a newspaper and less like a book. It should not be a static site that you set-up and never touch again. It should be a dynamic source of insights identifying you as an authority in your trade or business. This is best accomplished through regular blogging. Give your site visitors professional inside tips about your industry, let them know about major milestones in your business (new hires, new offices, new equipment), offer case studies of the great results you achieve for your clients...the list of blogging topics are endless. When you do this, Google & Bing will gobble up all of that content and will grow to love your site that much more for all the information you have created. Be sure to let Google & Bing know about your new content pages through their webmaster tools (GWMT & BWMT). The final results will be a better experience for your site visitors and better rankings and visibility on search engines. We recommend at least 1 blog post a month but you should really be shooting for 1 per week. Backlinks are the secret sauce of a successful SEO campaign. Bing & Google pay huge attention to them and they act as a nitro boost to your rankings. So, leverage the hell out of any opportunities you have for getting a legitimate backlink. But, DO NOT, under any circumstances, get spam crap links from free link directories or anything of that ilk. Google & Bing will notice spammy backlinks to your site and will punish your site or even remove it from their index if they detect a bunch of spam links to your site. Instead, work with companies that you have a relationship with that might list you on a preferred vendor page or on a blog article. We hope that you found the above information interesting, insightful, and highly actionable. If any of this is over your head and you think that you might need a pro to get it done, shoot us an email at team@capiscomarketing.com and we will be happy to help!